BUFFALO, N.Y. (WKBW) — The Buffalo Police Department is investigating a potential hazing incident at a University at Buffalo Sigma Pi fraternity house on Custer Street. Police say a UB student, Sebastian Serafin-Bazan, an 18-year-old freshman from Port Chester, N.Y. was sent to the hospital with "a serious medical condition believed to have resulted from the incident." 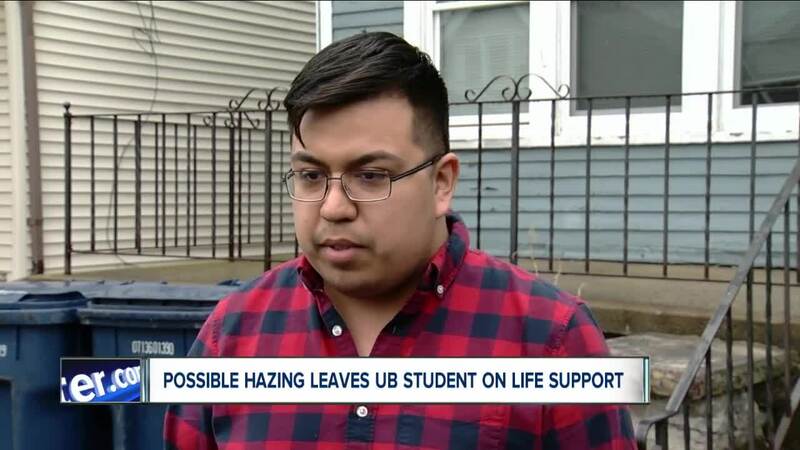 University at Buffalo officials can confirm the identity of the undergraduate student who was the victim of a suspected hazing incident early Friday morning. He is Sebastian Serafin-Bazan, an 18-year-old freshman. His hometown is Port Chester, N.Y. We can also confirm that he is a patient at Buffalo General Hospital. However, we cannot provide an update on his medical condition because of federal privacy laws protecting patient information. Out of respect for the family’s privacy, the university will have no other comment at this time. A source close to the investigation tells 7 Eyewitness News, as of Friday evening, the student was in critical condition and on life support. The University at Buffalo says the university is in contact with the student's family to provide any assistance. UB President Satish K. Tripathi has suspended the official activities of all fraternities and sororities, effective immediately and until further notice. UB says they have a zero tolerance policy for hazing and students involved can face suspension or expulsion. UB President Satish K. Tripathi. UB released a statement Sunday afternoon, stating an internal review committee will examine the activities of all Greek-letter, social, fraternal organizations at UB. Beginning this week, the university will launch an internal review into the activities of Greek-letter, social, fraternal organizations at UB. An internal review committee, formed by UB Vice President for Student Life A. Scott Weber, will examine each organization’s health and safety educational programs, policies and practices, with a special focus on anti-hazing. Anyone with any information is asked to contact University Police at 716-645-2222. Due to multiple inquiries UB has posted an FAQ which you can read here . "Sigma Pi has recently learned of a reported allegation of health & safety policy violations at Epsilon-Omicron Chapter at the University at Buffalo. At this time, we are currently gathering information and, if necessary, will provide further comment after all facts have been gathered."